Is there a tutorial with all the steps on how to create an index in a Publisher file? I found the Text > Index option, but it's not clear to me how to add it to the book. Locate the terms in your text that you want to index. Position the text cursor Immediately after a term, and use the Menu Text > Index > Insert Index Mark (or default shortcut Ctrl+Alt+Shift+[ on Windows). You get to choose the term that will display in the index, and for sub-entries in the index you get to choose a parent entry. When you've inserted some index marks, you can move on to step 2. Draw a Text Frame where you want the actual index, put the text cursor inside it, and use Menu Text > Index > Insert Index. Note that there is also an Index studio panel, which you activate via Menu View > Studio > Index, which lets you adjust the index in some ways. It also includes icons for inserting index marks, and some other functions. And you may find the Menu option Text > Index > View Index Marks useful. Also, from the Index panel, you can right-click on an index topic and get some useful functions, among them the ability to find that term elsewhere in the document and index those other occurrences. There is information in the Publisher Help about the Index Panel, too. There is no tutorial yet, as far as I know. Thanks a lot. That was really helpful! Wow, thanks! This is really clear and helpful. The AP help for Index and Index Panel made no sense and I couldn't find a tutorial either. After reading your short "tutorial", I had my index up and running in about 10 minutes. Is it possible to create more than one index? Say, an author's index, a subject's index etc? No. Publisher allows at most one index in a document. But you can make multiple tables of contents. Maybe this way you will reach your goal. Having added one, you can use the Index panel (View > Studio > Index) to find other occurrences of the term and add more index marks. Right-click on the term entry in the panel, select Find in Document, and you get a list of all occurrences of the term. Each entry in the list has a check-box to add it to the index, or not. I understand but I have over 200 words to index with an average of 10 occurences each so that's at least 2,000 clicks. Is there any way to easily re﻿move the index marks? I thought you were wanting to create index entries, not delete them? Where did the index marks come from in the first place? You only get them when you intentionally add them. Then (I think) you will need to do some clicking to remove the entries the editor no longer wants, or delete the Index completely and start over. No. Index marks must be deleted manually, as far as I can see. Serif needs to add such items into the Find panel (like with tabs, returns, etc). No crash on Mac. Pasting into the find window gives nothing being in the find section. The index mark is either not pasted or not copied. The second column allows for a "parent" index word "Services" (I think indenting in the index child below the parent might be optional in some cases). The follow-on for this type of feature is a "command" to remove all index entries from the document in one fell swoop. The clear advantage of the Concordance file is that it can be used for many different documents, especially in a situation where many documents are 'technical' or fall into a particular genre. 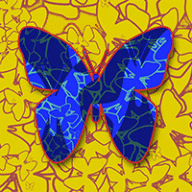 The file can be kept, shared among coworkers, added to over time, and edited as needed to restructure the final index appearance. I have no idea shat a Concordance file is. Can you tell me where I can get more information? Yes, I'm in the same situation with regards to the text in AP. In an ideal situation, the application itself would "dump" all the text into the concordance file and then let you edit that for the personal touch. Then the application would read that file back into the document to create the index. even MS Word does not offer that "dump" feature. It gets tricky though - phrases and parent/child (topic/sub-topic) relationships would need to be handled manually during the editing regardless. How do I get the alphabetical letters to show up with the indented words? Also, I tried to insert a "tab" of periods (like I did in the TOC) but they don't show up when I select that paragraph feature, the "." Honestly, not sure I want that feature, but would just like to know how it should work. Lastly, some words cause the page numbers to wrap around to the next line or two lines. Is there a way to indent the second and subsequent lines of page numbers so that they are not sitting on the left margin? How do I get the alphabetical letters to show up with the indented words? Also, I tried to insert a "tab" of periods (like I did in the TOC) but they don't show up when I select that paragraph feature, the "." Honestly, not sure I want that feature, but would just like to know how it should work. 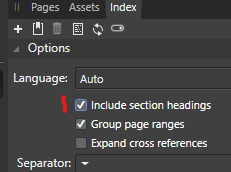 In the Index options you can choose to use a tab as the separator. Then, find the paragraph style that's assigned to an index entry. By default it's Index Entry 1. Find that in the Text Styles panel and double-click it to edit the style definition. Choose the Tab Stops section of the definition, and add a tab stop at the distance you want. 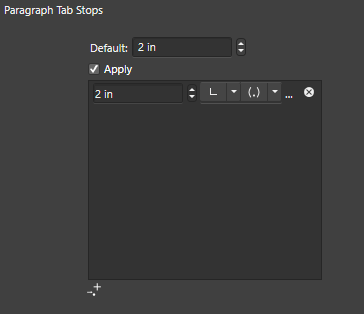 Then, in the definition of that tab stop you can specify the separator characters.